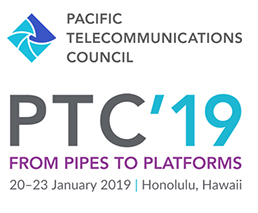 The ManSat Group played a key role at the recent Pacific Telecommunications Council (PTC) conference, the Pacific Rim’s premier telecommunications event which was conducted over five days in Honolulu and attracted major players in the global communications industry. 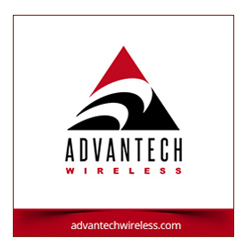 PTC is a global non-profit membership organization promoting the advancement of information and communication technologies in the Pacific Rim, spanning more than 40 nations and Island states. At the conference, ManSat co-sponsored the Satellite Leaders Lunch with ManSat CEO Chris Stott co-moderating a six-strong panel of satellite industry CEOs, including Mark Dankberg of Viasat and Steve Collar of SES, both of whom are active on the Isle of Man in the satellite industry. Chris also interviewed James Yenbamroong, CEO and founder of Thailand’s muSpace Corp.
‘The Satellite CEOs panel was a fascinating discussion exploring key questions facing the global satellite industry and looking at the role SATCOM will play in the Pacific over the next 10 years,’ said Chris. ‘Satellite is absolutely critical to Island states and digital communications across an area as vast as the Pacific and it is vital that the industry develops to meet the needs of users. Katherine Gizinski, Vice President of Sales and Marketing at ManSat, added that the Conference was a great opportunity for the global communications industry to discuss the latest developments and critical issues facing the Pacific Rim. Satellite has, and will continue to be, a cornerstone in serving the growing needs of users throughout the region. 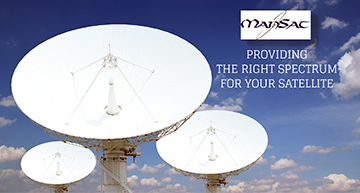 As ManSat continues to grow and adapt to innovations in the industry, the PTC conference was an excellent venue for the company to engage with industry leaders and innovators from around the world.